Sabrina is a beautiful woman who has been having the worst luck with men. Tired of one night stands she vows to “save her cookies” until the day she gets married and prays for God's help to find Mr. Right. Soon after she cute meets Jason Taylor and six months later they decide to marry because she her job is sending her to China. The wedding will be held on her parents estate off Cape Cod. In the classic have meets the have nots the Watson's and Jason's single mom, a postal worker in Brooklyn are destined to collide. Sabrina Watson (Paula Patton) career-making transfer forces Jason (Laz Alonso) a Wall Street financial analyst to propose as they both feel they have met their soul mate. Sabrina's old money parents Claudine (Angela Bassett) and Greg (Brian Stokes Mitchell) are pulling out all the stops for a rushed and elegant wedding at their stately home on Martha's Vineyard. Jason's mom Pam (Loretta Devine) has been voicing some issues about her son's fiancée who she thinks is too uppity to make an effort to meet her. She doesn't realize that it was her own son keeping them apart. He loves his mom but knows what an abrasive personality she can be. Heading to the island to spend the weekend at the Watson home Pam is in the mindset that the new in-laws are bound to be snobs. Claudine is also anxious about meeting Jason's working class family and it doesn't help when Pam shows up with Uncle Willie (Mike Epps), Pam's best friend Shonda (Tasha Smith) and Jason's best friend from the neighborhood Malcolm (DeRay Davis). Claudine is a bit miffed at the extra people she must find rooms for, and doesn't seem all that grateful for the homemade sweet potato pies that Pam had brought to the party. The weekend also includes Claudine's sister Geneva (Valarie Pettiford) and the two share a family secret, Sabrina's best friend Blythe (Meagan Good) who discovers the joys of cooking with the wedding chef (Gary Dourdan). Produced by Dallas pastor T.D. 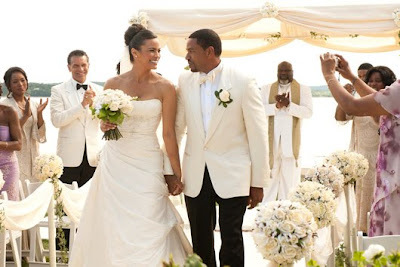 Jakes (who has a small part as the pastor of course) Jumping the Broom doesn't have the heavy handed approached to the usual faith based films. TV director Salim Akil worked with a script by Elizabeth Hunter and Arlene Gibbs which shows a little different approach to the family dynamic that is often portrayed in movie involving African-American characters. The movie has a broader appeal with the rich vs. poor, the craziness of putting on a wedding, the traditions that often fall by the wayside as people try to carve out their own. When Pam brings the broom that she used at her wedding, she becomes even more annoyed with her new in-laws who don't want to include it. The production is beautiful, the acting ensemble is like people watching at a wedding when you don't know anyone. Its the clueless wedding planner Amy (Julie Bowen) who steals the show.